If you plan to host a St. Patrick’s Day party to celebrate, make sure you outfit your walls, doors, tables, and ceiling with lots of St. Patrick Day decorations. 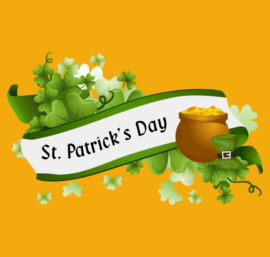 For all St. Patrick’s Day 2019 party supplies visit our locations in NYC and Long Island. Here are a few decorating tips to help make your party space look fun and festive. Think Green: The staple color of St. Patrick’s Day is green. Incorporate this color into all aspects of your decorations to transform your party into an Irish celebration. A simple and easy way to do this is to buy green balloons in a few different shades (you can also mix in orange and white). Bundle the balloons together to create bouquets using green ribbon. Place the green balloon bouquets around your party—tie them to chairs, tables, and anything else you can find! Shamrock Idea #1: St. Patty’s Day is all about the luck of the Irish. To play off this idea, use shamrock decorations throughout your party space to add an Irish touch. One creative way to do this is to make shamrock coasters. Use green construction paper to cut out shamrocks large enough for a cup to fit on. Once you’ve cut out your shamrocks, laminate them to make them sturdy and waterproof. Place the shamrock coasters on tabletops throughout the party for your guests to use. Shamrock Idea #2: Another creative way to tie shamrocks into your decorations is to make shamrock nametags. To do this, cut shamrock shapes out of green construction paper and print the names of your guests on each one. Next, laminate each shamrock to make it durable. Finally, glue a pin on the back of each nametag so your guests can pin it to their shirt to wear during the party. This idea is particular great if you are hosting a large party to make it easier for everyone to learn each other’s names. Centerpiece Idea #1: An essential part of any party is the table décor. For St. Patrick’s Day, try to incorporate Irish inspired decorations and centerpieces to keep with the party theme. Incorporate iconic items such as shamrocks, leprechauns, and pots of gold into your table centerpieces. For example, put together a green bouquets of flowers such as green carnations, ferns, and zinnias. Cut out shamrocks and glue them to dowels that you spray-paint green, then stick them into your flower arrangement. Centerpiece Idea #2: Another personal touch that you can add to your table is to make your own “pots of gold”. To do this, buy or make black bowls to act as the pots. For the gold, fill your pots with gold chocolate coins. These gold chocolate coins can be found at most party supply stores or grocery store. Encourage your guests to take home any leftover chocolate coins as a party treat at the end of your St. Patrick’s Day celebration. We hope you found our ideas helpful. And don’t forget that for all party supplies, balloons and decorations you can visit any of our locations in Queens, Brooklyn and Long Island.